Inviting you lot to take part in the dataviz hackaton: March 2015, Amsterdam. Visualizing the health of the Internet using open RIPE Atlas data. RIPE Atlas is a global network of thousands of probes around the globe that measure Internet connectivity and reachability, providing an unprecedented understanding of the state of the Internet in real time. 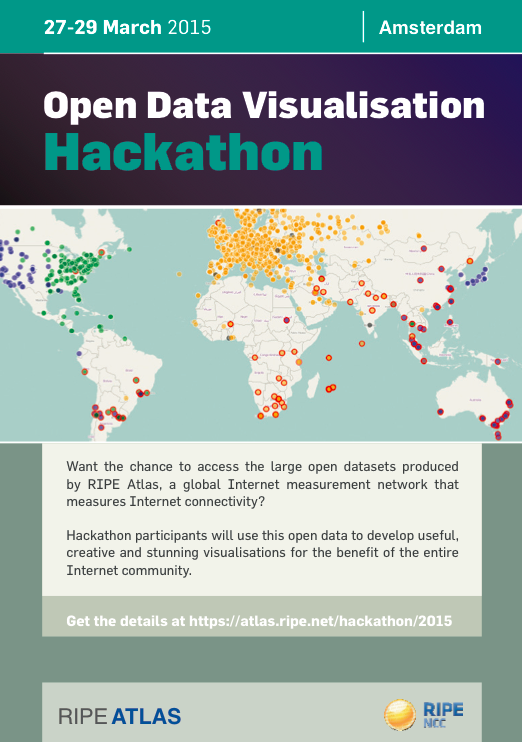 We’re challenging developers, designers and operators to use the large amounts of open data collected by RIPE Atlas to come up with data visualisations during our first-ever RIPE Atlas hackathon. The results will benefit the entire Internet community and will be made available to everyone on GitHub. We’ll also give an overview of existing RIPE Atlas data visualisations of interest to the community in the hopes of sparking new ideas among attendees. Find out what RIPE Atlas can do for you – and what you can do for RIPE Atlas! Some travel expenses will be covered, and there will be prizes offered by Comcast, awarded for 3 best teams by the jury panel. This page was last modified on 27 December 2014, at 15:26.